In 1944 he opened his own office in Chicago, Jack Morgan Associates, with a staff that included Harry Giambrone, John Defner, and Burton Kelly. From 1948 he consulted with Dormeyer Corporation designing hand mixers and hand drills. Other clients included Hotpoint, Magic Chef, RCA (stoves), Camfield, Webcor, and Amerock in the 1960s, maker of cabinet handles. 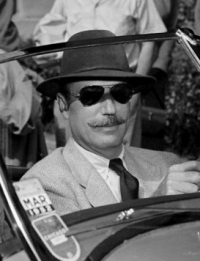 Morgan was a colorful personality who wore dapper clothes and had a romantic designer mustache. He affected a Latino persona, had a wonderful sense of humor, and called himself Juan Ricardo, which, of course, was his real name. He was a member of ASID, and was active in its Chicago annual meetings in the 1950s. After his retirement he continued his career in fine art, as described earlier. His last address in 1986 was in McHenry, IL.